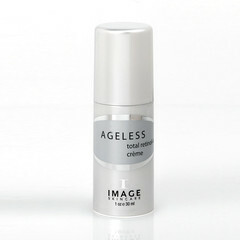 Ageless Total Retinol A Creme one of Image Skincare’s many natural anti aging products. Ever have a day where you wake up, look in the mirror and realize that your face is looking more tired and less bright? It might be time for an update in your skin care routine. Learn how to update your skin care routine to look years younger. Taking great care of your skin with natural anti aging products is one of the most effective ways to shave years off your looks. A great first step to revamping your routine is to start with a great exfoliator. The Ageless Total Resurfacing Masque can be used to reduce age spots and create a more even skin tone. Using a daily cleanser, serum and moisturizer can help to protect and repair damage due to aging and the elements. Image Skincare’s Ageless Total Facial Cleanser and Ageless Total Anti Aging Serum are two simple steps to cleanse, fight wrinkles and renew collagen for brighter, younger looking skin. The eyes are considered the windows to the soul. Unfortunately, that’s also where the first signs of aging can occur with fine lines, wrinkles and dark circles. A quick trick to brighten your eyes is to use anti aging skin products that are specifically developed for your eyes. Ageless Total Eye Lift Creme tightens around the eyes while brightening dark spots. Natural anti aging products also protect cells from damage and repair with antioxidants that work at the cellular level. As eyes age, lashes become sparser and less full. Ageless Lashes Clear uses a blend of natural botanicals to make lashes fuller and younger looking. Your skin care routine should be customized to solve challenges that your skin faces along with reducing the signs of aging. Image Skincare’s anti aging skin products solve problem areas such as rosacea with the Ageless Total Skin Lightening Serum. For acne-prone skin, the Ageless Total Retinol A Creme hydrates and repairs aging skin while reducing acne.